As founder of UAE’s foremost home-grown auction house for art and luxury collectibles, Lavesh Jagasia knows his art – not just from the aesthetic point of view but also from commercial perspective. As ARTIANA gears up to hold its next online auction on March 23-27, he takes us through the world of bidding and why South Asian art market is recession-proof. What’s the USP of your next auction? Our USP as an auction house is “what you bid is what you pay”; buyers at our auction do not pay any Buyer’s Premium over and above the winning bid amount. Other auction houses usually charge 25-30 per cent Buyer’s Premium on the final bid amount making the artworks more expensive. Our upcoming sale is about presenting Classical artworks along with Modern and Contemporary selection. This is a rare occasion when a sale of Classical South Asian art is taking place in the region and these will be presented with the expertise of world class scholars such as JP Losty for the Indian Miniature Paintings and Renzo Freschi for the Indian and Gandharan sculptures. For a buyer, what is the advantage of participating in an online art auction? Online art auctions give buyers the benefit of a seamless and convenient platform to bid from across the globe! They can view the works in our gallery and participate in our timed online auction as per their respective time zones. Online auctioning reduces the high costs associated with live in-room bidding of art and luxury collectibles. Buyers can also view all the details of the work and study the artworks through high-resolution images provided on our online auction platform, as if looking at the artworks in person. There are many buyers who prefer to remain discreet and this medium allows them that flexibility. Besides, there are options for ‘Proxy Bid’ in which case, a bidder can put in their upper limit bid and our proprietary auction application will bid on their behalf till this limit is reached, relieving the bidder of keeping a constant watch on the bid increments. MF Husain – ‘Islam’ – 1992 – acrylic on canvas – 78 x 139 in. What tips would you give an art lover who is participating in an auction for the first time? How should he or she make smart choices? Check the credibility of the auction house. Make sure that they are selling genuine art works by ascertaining their reputation and length of association with the sphere of art that they specialise in. Since art and luxury collectibles have a historically high value, make sure that you are getting the best value for your money by acquiring artworks that you love. Acquire a painting which you can live with for a long time, as art should not be acquired merely as an investment. It is an asset class which should be approached with a combination of passion and research. As much as possible, go for the auction houses who have a ‘No Buyer’s Premium Policy’ as it would save you from paying additional 25-30% of the hammer price. Jamil Naqsh – ‘Arrival’ – 2015 – oil on canvas – 48 x 30 in. Given the general economic slowdown, what is your assessment of the art market currently? Based on my experience over many years which have included both highs and lows, I would say that the South Asian art market is hugely undervalued. The economic slowdown may broadly affect the mood of the buyer temporarily but confidence is proved time and again by record prices achieved by top-end works in which rare and sought-after pieces see hectic bidding activity. This is proof that the market for quality works remains extremely strong in any economic scenario. Moreover, the Indian economy is growing at a very healthy pace and has remained unaffected by the economic slowdown in the Gulf and other emerging economies. In this current auction, majority of our artworks are by Indian artists. SH Raza – ‘Emergence’ – 1988 – acrylic on canvas – 31.5 x 31.5 in. Can you recommend some South Asian artists to watch out for? We always recommend acquiring the established masters from South Asia. The established artists we recommend any serious collector to acquire would be from the ‘Progressive Artists Group’ such as M. F. Husain, S. H. Raza, F. N. Souza, Ram Kumar and other artists such as Sakti Burman, Jehangir Sabavala, Jogen Chowdhury and Jamil Naqsh. 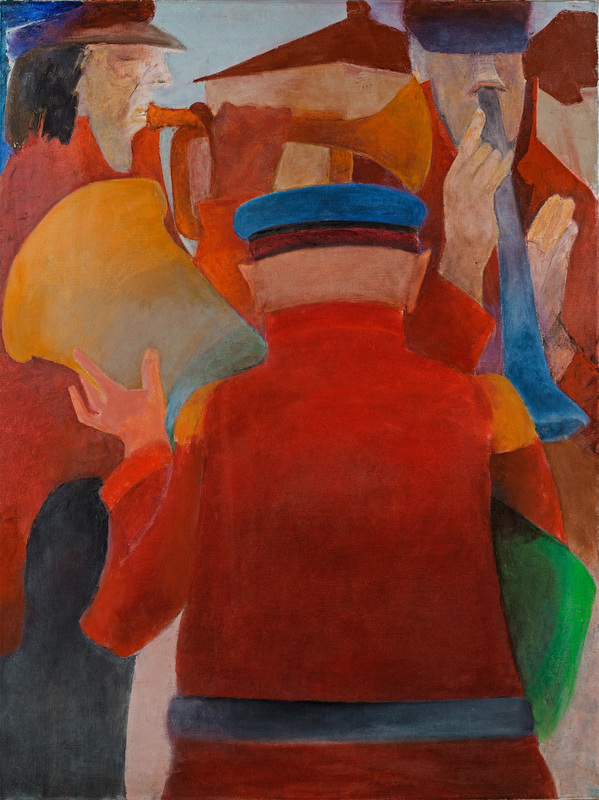 Krishen Khanna – ‘Bandwallas’ – 2003 – oil on canvas – 40 x 30 in. What are your favourite pieces that will be going under the hammer in the auction? We have a seminal work of S. H. Raza titled ‘Emergence’; this work was painted in 1988 and has been published on the cover and inside of one of the artists’ most important books. There is a very large work of M F Husain titled ‘Islam’, this massive work is from his ‘Theorama’ series and is worthy of any museum acquisition. Artiana, the UAE’s only home-grown auction house will hold its third online auction of South Asian Art from March 23 to March 27. The lots on offer include classical Indian and Gandhara sculptures from the second and third centuries, early Indian miniature paintings and rare works by leading South Asian modern and contemporary painters and sculptors. Highlights include breathtaking ancient sculptures of Buddha and Indian deities, S.H. Raza’s 1988 painting, ‘Emergence’, which appeared on the cover of Alain Bonfand’s book, Raza; and a large museum quality work by M. F. Husain titled ‘Islam’, from his Theorama series. Estimated prices start at $800 for some miniature paintings. A unique feature of Artiana’s auctions is that it does not charge a buyer’s premium, which typically ranges from 25 to 30 per cent of the purchase price. Thus, buyers have more leeway while bidding and sellers can get better prices. The auction catalogue is available at www.artiana.com and those interested can also physically view the artworks at Artiana’s viewing gallery in Downtown Dubai. The auction begins at 6pm on March 23 and final bids will be accepted between 6.30pm and 9pm on March 27. Buyers from around the world can place their bids whenever it is convenient for them during the auction. They can also bid on the move via Artiana’s state-of-the-art proprietary application software that can be downloaded from Google Play for Android devices and the Apple Store for iPhones and iPads. The software also allows buyers to place a ‘proxy bid’ stating the upper limit of their bid, and bids on their behalf until that limit is reached, freeing buyers from keeping a constant watch on the process. 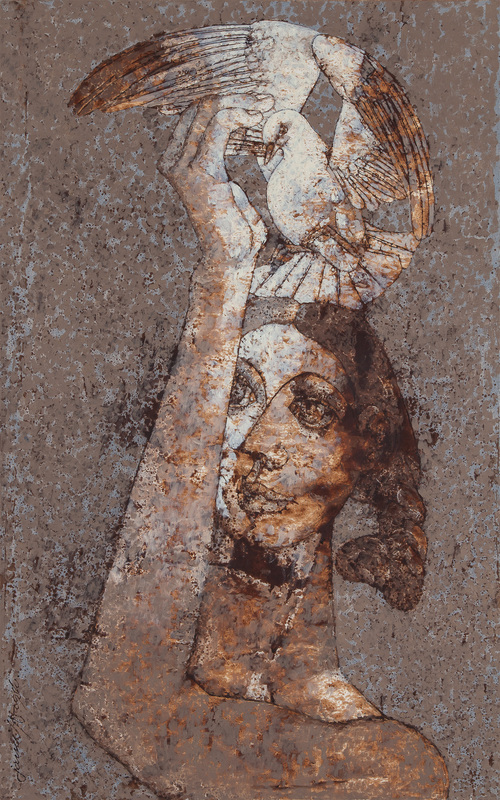 Artiana was founded by Lavesh Jagasia, an art expert specialising in Modern and Contemporary South Asian Art, and founder of art investment consultancy, The Fine Art Advisory, and art publishing firm, The Serigraph Studio. “This is the first time ever that a sale of classical South Asian art is taking place in the region, and we are delighted to have the guidance of world class scholars such as J. P. Losty, an expert in Indian Miniature Paintings, and Renzo Freschi, who specialises in Indian and Gandharan sculptures,” Jagasia says.